I planted foxgloves from seed last year and was delighted when they began flowering this spring. However, some of the plants started flowering then the stems started to brown and the plants have lost the flowers and the stems have broken in half. Does anyone know what causes this? Also I'm assuming that they are the biennel foxglove and was wondering if they will seed themselves for a new showing next year. I had a similar problem with a couple of mine...the leaves turned brown and then the whole plant. It looked like some type of viral or bacterial infection, but I'm not sure. I ended up digging up the infected plants and throwing them away. Foxgloves do reseed, so you may get more for next year. 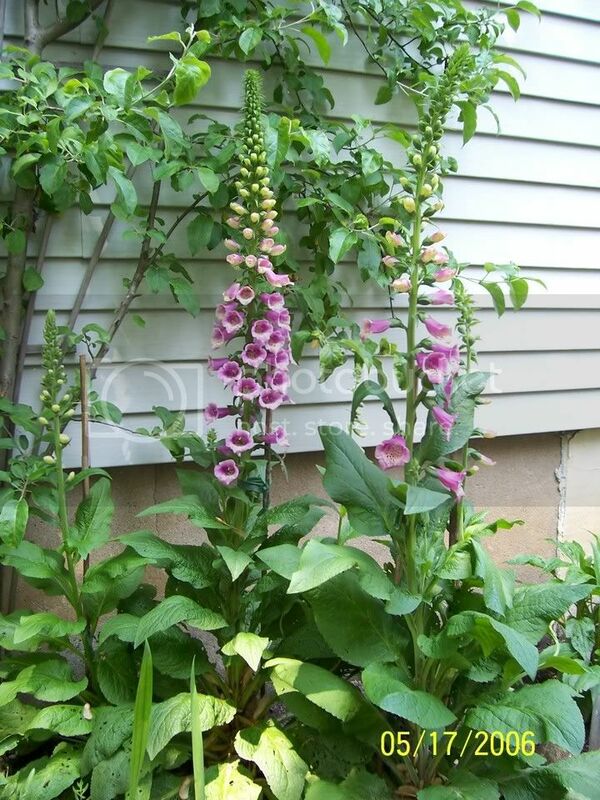 Foxgloves usually need to be staked to prevent them from breaking. You wouldn't happen to have a photo would you?? Where they done completely flowering for you??? A picture may very well help and tell us..
Will post a picture, but it was from when they just started blooming a couple of weeks ago. I have about ten of them all together. The one in the picture is over six feet and just about finished. Four to five feet in the picture. I have staked them all. The ones that bent over did it at the point of staking and weren't nearly as tall. Now how to a post a picture? then when you picture is posted there, copy the URL for that one photo, come to this post, go to the FULL REPLY FORM, and click on IMAGE button..
paste your URL into there and ADD REPLY button..
Any help, just give a holler to one of the hostesses, *or just about any of the regulars here and they'll be able to lend you a hand..
well that didn't work let me try again!!!! One suggestion- use taller stakes, ones that go almost to the top of the plant in bloom...that will help prevent it from breaking at the point where the stake stops. this is my poor wilting foxglove, the one beside it still thriving... they were magnificient looking, was very impressed with myself. web page Is it possible there is bore attacking the plant? Thanks for the help Weezie, think I really like this Photobucket site. When I orginally staked them I never in a million years thought they would get to 6ft. Perhaps I should have used taller stakes, but I don't think that has anything to do with the wilting. The one that is 6ft. has similar size stake (will be changing today) and it is doing wonderfully. but the base of it can re~send up shoots..
so, it can theoretically live for several seasons..
is this in a traffic area, to the front door?? 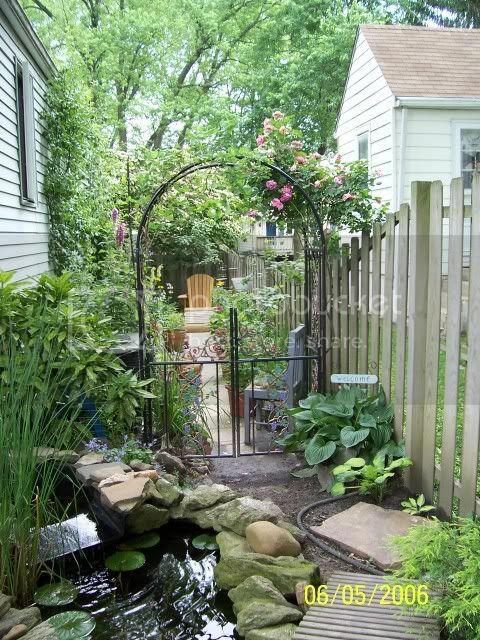 or a back door, a walk way??? Kids passing thru your yard?? in fact, I never even touch mine.. I tried Webshots, and couldn't for the life of me figure it out, so I snuck a peak at it after Cindy *Afgreyparrot* suggested it..
here is a picture of one that's wilting but hasn't bent in half as of yet. oh silly me ... these are on the second page aren't they ... can ya tell I'm blonde?